Born in 1942 in the Chiota reserve, near Marondera (North Eastern Zimbabwe), his early childhood and family experiences were to influence the directions and philosophies of his adult life. As a young man he moved to Harare to find work and in 1966 he visited the National Gallery and saw the astonishing stone sculpture for the first time. A chance meeting with Tom Bloomfield that same day led to the invitation to join the new sculptor's comrnunity at Tengenege. With no previous artistic experience other than basic lessons during his school years, hejoined thenow famous sculptors such as Bernard Matemera, Ephraim Chaurika and Henry Munyaradzi. However, keeping to himself, and struggling to forge his own ideas and style in the hard Guruve Serpentine he was to spend the following two years establishing his name as one of the leading Tengenenge sculptors. A fiercely independent artistic spirit, obviously throughout his career, was to force Mubayi to break away from the closed comrnunity and return to Harare. His help was enlisted by Frank McEwen in establishing the influential Vukutu sculpture workshop, his years at Vukutu saw the creation of some of Mubayi's most striking work. The fusion of spiritual and earthly worlds as well as human and animal iconography inspire the work of Sylvester Mubayi. Dedicated to the beliefs and traditions in which he was raised he says "I know my culture. I know how to supplicate my spirits. Our people they are following the English or European culture - they don't know what they are doing. .Myself I won't leave my culture." This sentiment is confidently expressed in every aspect of his sculpture and his day to day life. His career has influenced and been influenced by many of the major events in the development of sculpture in Zimbabwe; the earlier years at Tengenenge; the establishing of Vukutu; the difficult years during the liberation struggle where his strength of character gave heart to other struggling artists. It was during the war years that the important friendship and working relationship with Roy Guthrie began, an association which is still strong today with Mubayi enjoying "Invited Artist" status at Chapungu, the highest acknowledgement of artist excellence the Park can bestow. After Independence his powerful works were acknowledged at his one man exhibition at the Francis Kyle Gallery in London. The first line of the review by Michael Shepard of The Sunday Telegraph read as follows "Now that Henry Moore is dead, who is the greatest living stone sculptor? Where I to choose, I would choose from three Zimbabwean sculptors - Sylvester Mubayi, Nicholas Mukomberanwa and Joseph Ndandarika". His work, which has received great international acclaim from exhibitions dating back as far as 1971,is remarkable for its spiritual power. It speaks to young and old and acts as an inspiration to art lovers and artists the world over. Looking back on his career Mubayi feels justly proud. He maintains that his need to sculpt is as strong now as it was some 25 years ago he suffers when he is unable to work. 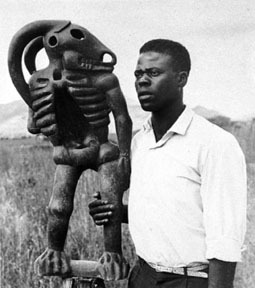 "Certainly when I knew him he was by far the greatest sculptor there (Vukutu)... I have tremendous admiration for him. Some of his work is as great as anything in the world. One of the finest sculptors of this century" - Frank McEwen, 1987. In the early years of his career Mubayi's sculpture was uncompromising and very powerful while in recent years it has become more reflective, often tender and emotive. He is highly respected by both the younger and older artists of Zimbabwe.